One of the best things about fall is the abundance of delicious apple recipes that I love finding and making. Of course, I love baking and cooking with pumpkins this time of year too, but there is just something about apple desserts that I find cozy and comforting. I've never gone apple picking, but judging by all the pics on Instagram I've been seeing, there are a lot of people that do. It's definitely something I want to do one of these days, and preferably in a beautiful orchard with a plaid blanket and gorgeous picnic, and wine, and... ok, so not everything on Instagram is the way it appears, but dang, they make it look so good! 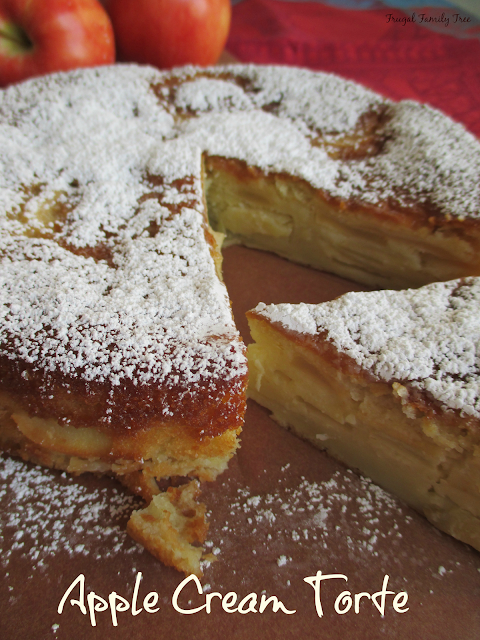 Anyway, back to this delicious Apple Cream Torte that I found in the September issue of Sunset Magazine. A cream torte is like a cross between a cake, a custard, and a Dutch baby, according to the magazine, and I completely agree with them. It's absolutely more custardy than a regular cake, and that's one of my favorite things about it. The recipe calls for 3-4 thinly sliced apples, and I went with four and think that's the perfect amount for this torte. I love, love, love how the slices of apples bake on top of each other for this gorgeous effect you see when you slice into it. You can use a variety of different apples like Cameo, Fuji, or Gala, and I used Gala just because they are so easy to find. 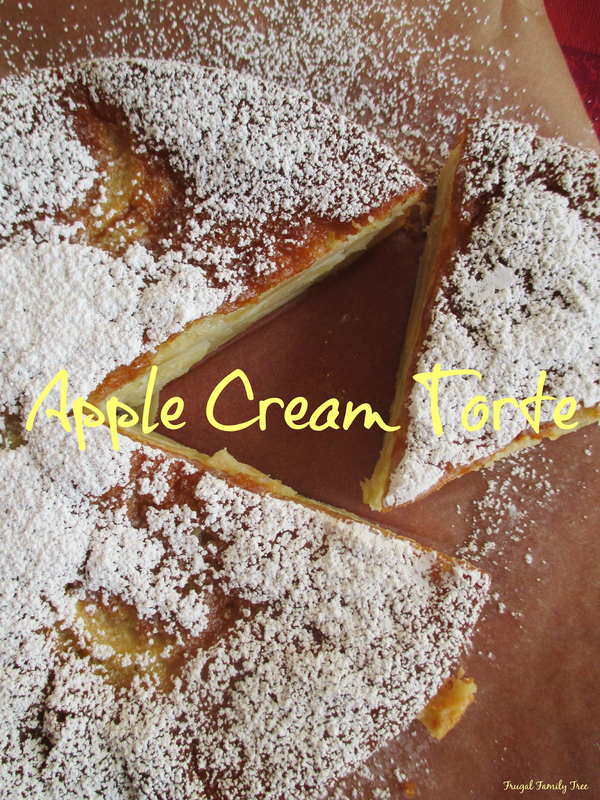 But next time I make this torte I'll try a different kind to see if it makes a difference in taste. I made this for dessert for my family one night and they all loved it. The recipe is a keeper for sure, and one that I'll be sure to make again and again. If you wanted you could add a little crème fraiche or whipped cream on top, but I thought it was perfect without it. Preheat oven to 325 degrees. Butter and generously flour a 9-inch spring form pan. Shake out excess flour and set aside. Using a paring knife or sharp corer, core apples from stem down through seeds and base to remove in one cylinder. Peel apples and slice crosswise into 1/4-inch rings. Set apples aside. In a large bowl, using a mixer with whisk attachment, beat eggs and granulated sugar on high speed until pale and slightly thickened , 1 1/2 to 2 minutes. Reduce speed to medium and add cream and vanilla. Beat about 30 seconds more to blend. Add flour, baking powder, and salt and blend on low speed until evenly combined. Serve warm or at room temperature, dusting with powdered sugar.